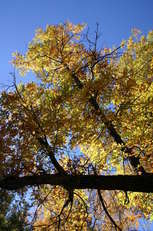 After leaving Saguaro National Park the previous afternoon, we'd covered quite a bit of ground. We'd driven all across the rest of southern Arizona, which after coming down out of the mountains west of Tuscon, is rather boring flat desert. Full of life I'm sure, but about as interesting as driving across any other flat empty land. Central Wyoming, Southern Idaho, and probably most of the corn belt all come to mind. We'd visited the New Mexico Visitor center, which was not very helpful, and didn't even have toilets. 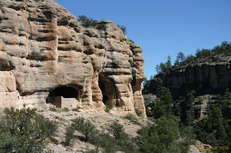 (They were being fixed) and decided to drive up to Gila Cliff Dwellings NM, to visit some hot springs. 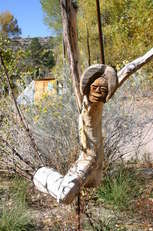 Katie had never been to hot springs, OR cliff dwellings. We had a good trip doing things that Katie had never done before. Or I did at least. I'm sure some of the things I made her eat she wasn't all that thrilled with, but so be it. I was trying to get to some noncommercial hot springs, but after driving all the way out into the Gila National Forest, and just missing closing time, we had to find some locals who knew where they were anyway. Katie bodly led the way talking, and we met some very helpful people, with maps even, who showed us where the noncommercial hot springs were, but said we probably didn't really want them anyay. Turns out most of them are quite a walk in, and not all that reliable anyway. 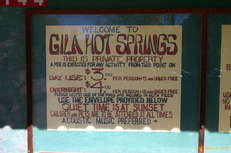 There was a place down the road, called quite simply, "Gila Hot Springs" which offered cheap camping, hot springs, and although commercial, was actually very nice. 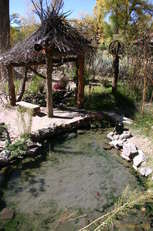 We took their word for it, and took the rough dirt road down to the "commercial" hot springs by the river. They weren't kidding! These were some of the nicest hot springs I'd ever been to. 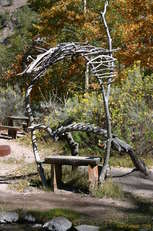 Obviously run by quite a character, the pools were decorated with all sorts of hanging mobiles and sculptures, made out of sticks, roots, wire, and glass. Very nicely done. A couple of composting toilets, some stumps and log benches, and a set of four pools leading from a couple of hot springs down towards the river, each one cooler than the one before it. We met some guys from New Mexico, and played cards with them before dinner, then had a lovely evening soaking in the pools, and chatting to those guys and two other girls from the area. Very relaxed, well adjusted people. Not obnoxious in the slightest. Shared some wine with them all, and eventually went to bed. The next day we went up to the cliff dwellings, which I was expected to be like all the other ones in the south west, but was actually quite a bit different. It was a proper cave in the cliff for starters, not just some overhang people had built buildings into. Quite different in style and structure from the "ancestral puebloan" ruins in the red rock south west. Katie was equally impressed. 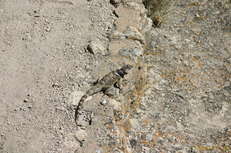 We got to see a couple of good lizards up here too, but unfortunately no Gila Monsters. Katie was well aware by now that I was hoping to see a rattle snake sometime in the desert, and she wanted to see neither snake nor monster. It was now on to Las Cruces, NM, (with some bubble gum blowing lessons for me on the way) where Katie knew some people, or failing that, visiting Dan and Rachelle in El Paso. We'd left messages for both, and hadn't heard back from either, (perhaps it would have been a good idea to have planned dates a bit better and called a bit more in advance :) so we headed out to White Sands NP. Katie had been there before when she had visited her friends in Las Cruces, and she was keen to show me. Arrived in El Paso, and got some mexican fast food while we waited for Dan to finish teaching his guitar lessons. The fast food joint even had beer! 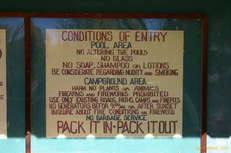 And unlike california, where the signs are in english and spanish, they were just spanish here. Had a tour of Dan and Rachelle's place, though Rachelle was unfortunately out of town for a couple of days. Discussed the finer points of corn chips and salsa over beer, and finally went to bed.